Wouldn't it be great if all your effort at the NACV Show continued working for you the 103 weeks between shows? Now it can, with an NACV Show Virtual Booth Tour video! Book time with our experienced video crew and record a guided ‘virtual’ tour of your booth, go in-depth on a new product or service or give a product demonstration. 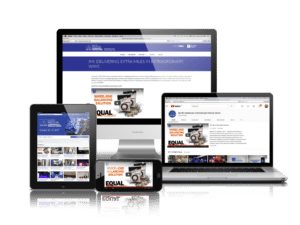 Our talented team of editors will then craft a dynamic and engaging 2- to 3-minute video you’ll be able to leverage in your marketing efforts long after you’ve left Atlanta. Give us 30-minutes in your booth and we’ll help you reach all those customers that couldn’t make it to the show. Not satisfied with a simple, interview-style approach to booth videos? We take the time to reinforce your sales rep’s presentation with product images, videos, animations, and other relevant visuals. We will also be sure to incorporate your company colors into the packaging design, and finish it off with your logo and a custom call-to-action message. We’re not done when your video’s done. We’re committed to helping make sure your video is watched by the people that count – buyers! The video crew that came to our booth was extremely professional, easy to work with and asked knowledgable questions. What I appreciated about the finished video was how well they incorporated the product shots and video footage I gave them. So I’d say the booth video is very good value for the price and I recommend it to any exhibitor. In fact, I’ve already booked mine for NACV.